Thanks to everyone's support, we are expanding! ​This has been an adventure of a year. One year ago in late October 2015, Jim and I first announced and offered the Southern Mountain Rifle Kit for pre-order. Six months later, in April of this year the first kits went out the door and in that time we have shipped over 200 kits (with many more on order) and we have done all of this from our little home workshop. We would like to thank everyone who has been a part of this project and helped it be so successful. Our current workshop is in our home. We have a small in-house team (and HUGE team of vendors and suppliers) and there is no way we could have done this all by ourselves. I would like to say 'Thank You!' to everyone who has been working with us and been so committed to raising the bar for muzzleloaders. I know a lot of you may already be familiar with Jim, but I wanted to introduce you to our little team. A very fresh-faced Jim started making flintlocks as a hobby in a converted coat closet when he was still in high school. He attended Ohio State and had a career as a metallurgical engineer until he was able to turn his hobby into a livelihood by making custom flintlocks about 8 years ago. ​Just last year he was able to combine his artistic and engineering sides of his brain when he developed the CNC carved Southern Mountain Rifle Kit. Jim will be getting back to working on custom projects again when the space of the new shop allows. Jim and I (Katherine) met in early 2014. He won me over when he showed me a picture of his silver inlaid fowler. 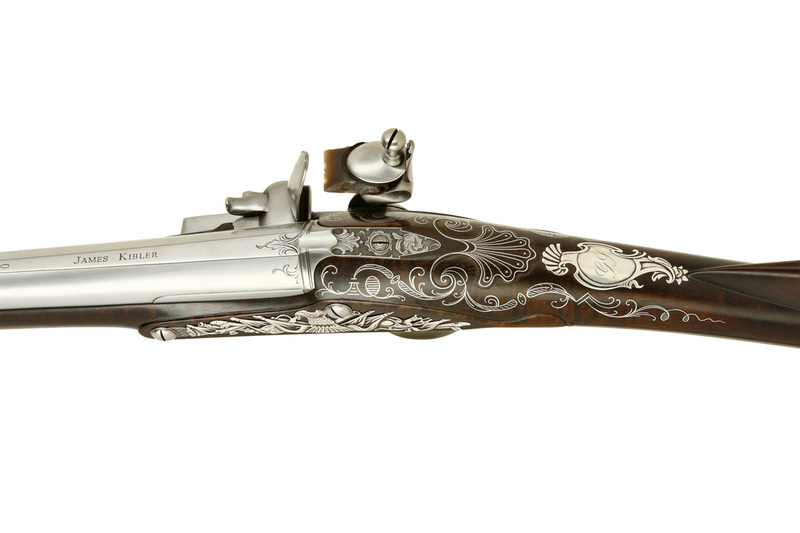 (photo here) I knew nothing about these old guns, but I immediately fell in love with the artistry and history and I decided to stick around. I was half-heartedly working as an accountant and instead started putting my efforts into spreading the word and trying to bring new people into the world of gunsmithing while also getting Jim's work out into the world by putting together his website. Walt works with us a few days a week and does a little bit of everything. Walt worked for many years as an accountant and he is one hell of a worker. ​Walt works on a little bit of everything from injecting the wax for castings to assembling the triggers. There are a number of parts that go into each kit, and each part is specifically chosen and/or made as a perfect fit to the stock and the overall quality that we are trying to put forth. He is a huge help. We couldn’t do it without him. Little Dog is our 3-legged, deaf shop mutt. She lost her leg because prior owners didn't know she couldn't hear the car, under which she was sleeping, started up and ran her over. She never got a proper name since she can't hear. She came with us last year to spend 10 days in class at NMLRA Gunsmithing Seminar at Western Kentucky University. She kept all the students company and would sneak treats from certain students who couldn't resist her particular form of 'pathetic charm'. She will be joining us again this June. The next kit, while not officially in the works yet, should be started in the next year. It will be an earlier, bigger gun that can be carved and can be finished as a Pennsylvania or Virginia rifle. I have started keeping a list of folks who want to be notified when it comes for sale so send me an email if you would like to be added. Due to the popularity of last year's class, a second week-long class has been added. This is a fun show that is open to the public in a fantastic facility. Last year was our first year and we can't wait to go back. We will be in the 'Supplier Room'. The 6-day Southern Mountain Rifle Kit Assembly class has a 3-day expansion option to allow for a patchbox, grease hole, or nose cap. In our new booth location at the end of the big room, we will again have kits that customers can get their hands on as well as finishing and carving supplies. The new shop! We will be able to welcome visitors and customers in our new 40 x 72 foot facility.